You remember Twinky, the enormous orange cat with the Cheshire grin and the funny white feet? Well, he is sick and he needs your help! Twinky has been diagnosed with a large, painful mass near his spine, and he needs surgery to remove it. We are praying it is benign. Twinky has been through a lot in his life. He was found abandoned in the Bronx and brought to Animal Care & Control where he was named “Crazy Toes” because of his syndactyl feet (toes fused together), and soon found himself on the “at risk” list. 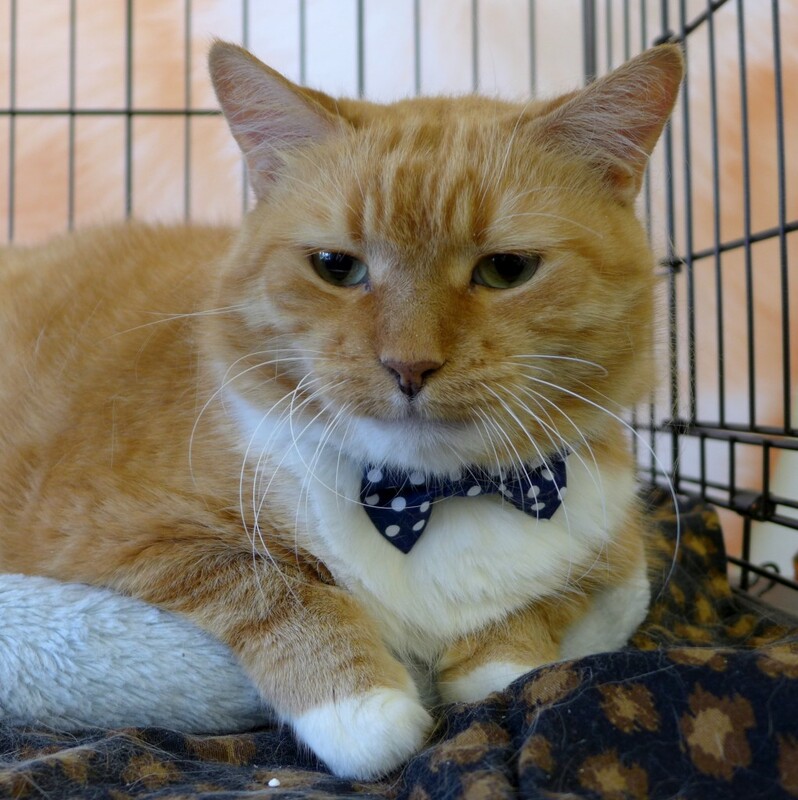 Because of his friendly attitude and large size, Twinky was the star of the Timber’s Legacy adoption events – especially when he wore his blue polka-dot bow tie, making him look like a veteran senator from the south! Everyone loved this vivid orange cat, but no one wanted to adopt him because his feet require him to be brought to the vet for professional toenail trimming every three weeks. Timber’s Legacy never gives up on our cats, so we have continued to foster him as though he were one of our own. Twinky is going to Animal Medical Center in Manhattan for treatment and surgery. Between bloodwork, ultrasound, surgery, and aftercare, we expect the bills to run in the thousands of dollars. This is a huge burden on a tiny rescue group like us, but we are devoted to this sweet boy and determined that he get to live the long, happy, pain-free life that he deserves. Even small amounts add up! All donations tax-deductible. On behalf of the Twinkster, THANK YOU! *Timber’s Legacy is an IRS-approved 501c3 cat rescue group located in Queens, NY and consisting solely of unpaid volunteers. All donations are tax-deductible.